There have been a couple of proposals to hike the Illinois state cigarette excise tax in recent years, including Senate Bill 44, which passed the Illinois Senate in 2010. This proposal would have hiked taxes by $1.00 per pack, creating a total state excise tax burden of $1.98 per pack. We project that this would have increased total smuggling in the state to 26.3 percent of total state cigarette consumption, up from just 5.9 percent in 2009. As with Michigan and Ohio, the majority of Illinois’ smuggling would be commercial, making up an estimated 24.3 percent of total consumption. 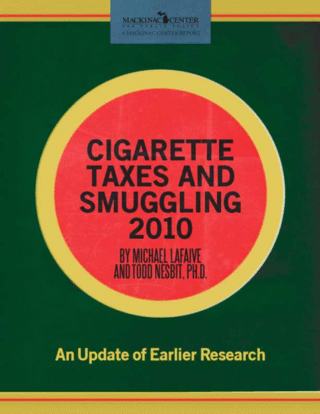 Such large smuggling increases might seem unlikely, but in a 2010 paper titled “The Micro-Geography of Tax Avoidance: Evidence from Littered Cigarette Packs in Chicago,” David Merriman calculated that 75 percent of the discarded packs of cigarettes he found in Chicago lacked a city tax stamp. More of the littered packs — 29 percent — came from Indiana than from Chicago itself, perhaps because Gary, Ind., is just 25 miles from downtown Chicago. Illinois Senate Bill 44 Engrossed, http://www.ilga.gov/legislation/ fulltext.asp?DocName=&SessionId=76&GA=96&DocTypeId =SB&DocNum=44&GAID=10&LegID=&SpecSess=&Session= (accessed Nov. 2, 2010). Merriman, “The Micro-Geography of Tax Avoidance: Evidence from Littered Cigarette Packs in Chicago,” American Economic Journal: Economic Policy 2, no. 2 (2010): 69.